somewhere in nevada is a comic about friendship. …well, okay, i guess i can’t get away with just that anymore. 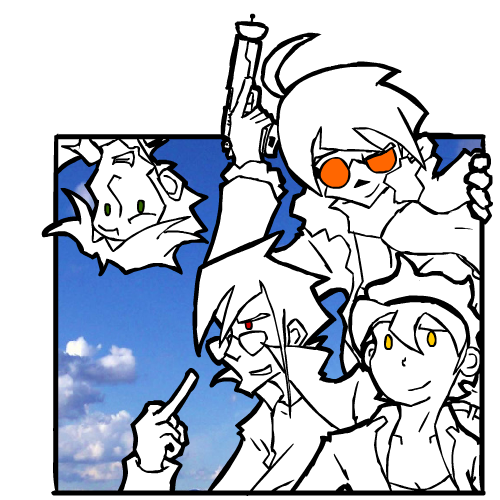 somewhere in nevada is an action/adventure/scifi comic about four friends who end up accidentally traveling through time and space thanks to a strange macguffin known as the “time gun” and a stolen limousine. as they tumble blindly through the slipstream, they encounter all manner of complications, including federal agents, strange xenofauna, robots, space aliens, wizards, and nuclear weapons. and all they wanted was to get to las vegas. SiN, barring some horrible period between december 2009 and october 2011, updates on mondays, wednesdays, and fridays; exceptions will be made based on unexpected circumstances and the artist’s fluctuating mental health.